It got second prize in the whole grade. My friend supplied some parts for it and helped me build it. 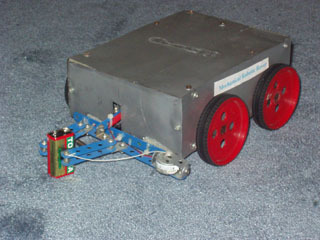 No electronics were used as it was our first Robot making attempt,But it was all mechanical. payload and with a full battery charge from 60-95grams.It can easily pick up any cell or 9v battery. The chasis are spray painted with silver colour. The battery that is used is Hitachi 6v 10ah battery, which supplies full power. No gear boxes were used. finding the right battery,motors and tools. But we overcame our problems by solving them one by one . Bye and see ya again with our any new robot!!!!!!!!!!!!!!! !